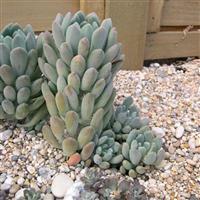 Blue-green succulent forming columns 4ins. high. Full sun or part shade great in scree gardens or containers. Flowering mid-summer orange/yellow flowers.